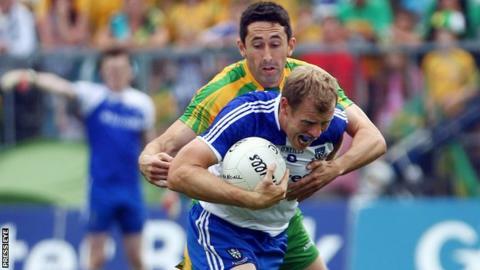 Monaghan's 2013 Ulster Football winning captain Owen Lennon has been forced to retire from the game because of an ankle injury. Latton clubman Lennon, 34, said that he had taken the decision following medical advice. "I'm certainly going to miss it but it's been an honour to wear the number eight jersey for so many years with club and county," said Lennon. "Unfortunately all good things must come to an end." Lennon was also part of the Monaghan squad which won last year's provincial title when they repeated their 2013 decider victory over Donegal. The midfielder played in last year's Ulster decider only two days after getting married. After making a full recovery from a serious back injury, Lennon was forced to undergo ankle surgery in 2014 but the ailment has continued to bother him over the past 18 months. Lennon made his championship debut for Monaghan against Fermanagh in 2002 and missed only championship game over the next 12 years. "Of course there have been good and bad days but thankfully the good outweighed the bad ones and I have made some friends for life," added Lennon. "I've been so lucky to have played along with such talented and highly motivated groups of players with the county, and also with my club."